Right now, it’s 4:29pm and I’m in a hotel room, in bed, with a glass of white wine, and a box of French fries. Judge away my friends, judge away! Well ok, by the time you read this I will actually be back home again, reuniting with Chickpea dog after my short trip to Montreal. Pet reuniting is high-priority stuff as all pet owners know, so I’m writing this post a little ahead of time… and I’m certainly not making vegan marshmallow fluff in this hotel room bed right now, that was made ahead of time too. I know what you’re thinking… well no I don’t… but I do know what I’m thinking, and I’m thinking the possibilities just got endless. 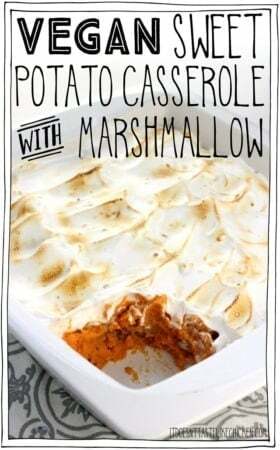 S’mores, sweet potato casserole, hot chocolate… I’m pretty sure I just gave away what several of the next recipes are going to be on my blog, but I just can’t contain the excitement about toasted vegan marshmallow fluff! It gets better. WHAT!? Yeah, it does. 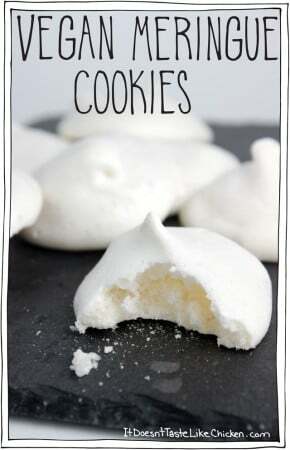 This recipe uses only 4 ingredients, the main one being aquafaba, which is the leftover liquid from a can of chickpeas (the bean, not the dog). How’s that for using up food scraps? And the whole thing whips up in about 10 minutes. No candy thermometers, no fussing about, just marshmallow fluff. 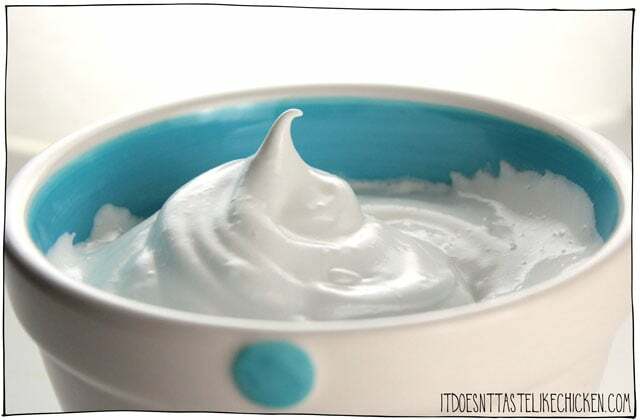 Enjoy by the spoonful (I did), or however you like to enjoy your vegan marshmallow fluff. My parents said it was a super delish topping on my Yes, This Really is Vegan Cheesecake recipe in Fuss-Free Vegan, (page 194). 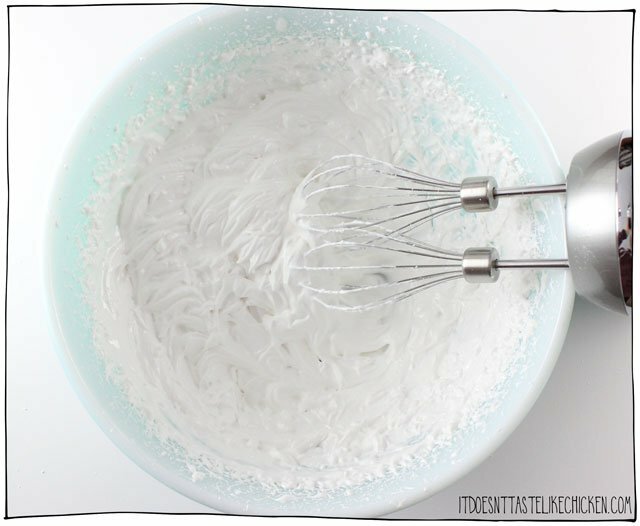 To make Easy Vegan Marshmallow Fluff: Add the aquafaba, vanilla, and cream of tartar to a large bowl or the bowl of a mixer. Use the mixer or a hand mixer to beat the liquid for about 1 minute until it starts to get fluffy. Slowly sprinkle in the sugar while the mixer is on. At this point, it may get a little more liquid but don’t worry, just continue to beat for about 10 minutes until a stiff peak is formed. When you lift the beater the fluff should look glossy and hold a stiff peak, even if you jiggle the bowl the peak should stay as is. It may take more or less time depending on your mixer and brand of aquafaba. Enjoy! Just 4 ingredients make this easy vegan marshmallow fluff that taste just like marshmallows and can even be toasted for the perfect s'more! Adapted from my Vegan Meringue Cookies recipe. 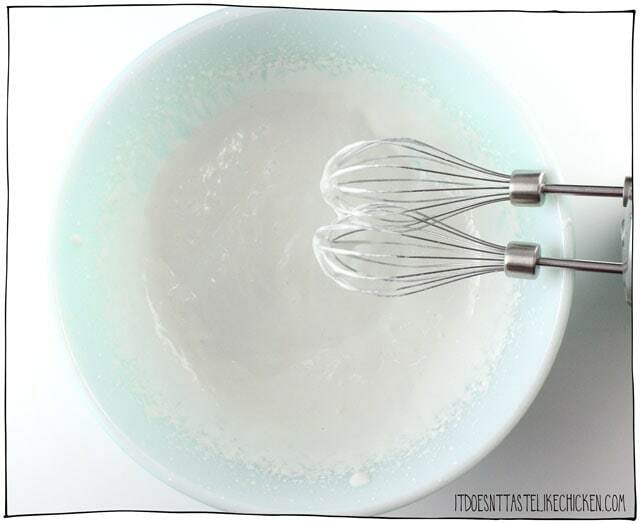 Add the aquafaba, vanilla, and cream of tartar to a large bowl or the bowl of a mixer. 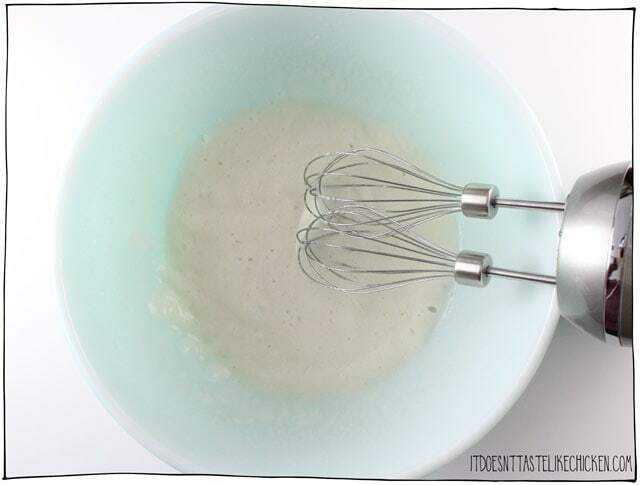 Use the mixer or a hand mixer to beat the liquid for about 1 minute until it starts to get fluffy. Very slowly sprinkle in the sugar a spoonful at a time while the mixer is on. Continue to beat for about 10 minutes until a stiff peak is formed. When you lift the beater the fluff should look glossy and hold a stiff peak, even if you jiggle the bowl the peak should stay as is. It may take more or less time depending on your mixer and brand of aquafaba. *I prefer using canned chickpeas that are salt-free (check the ingredients). The chickpeas with salt may have a slight bean taste, whereas the salt-free ones do not. Either salted or unsalted will still work. 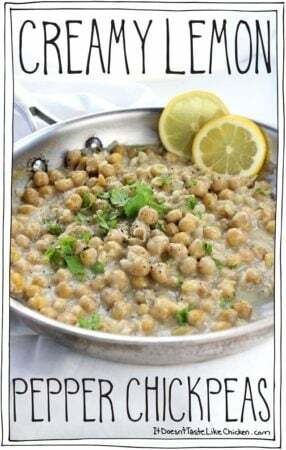 1 can of chickpeas will contain about 1 cup of liquid. *Store leftovers in an air-tight container in the fridge. 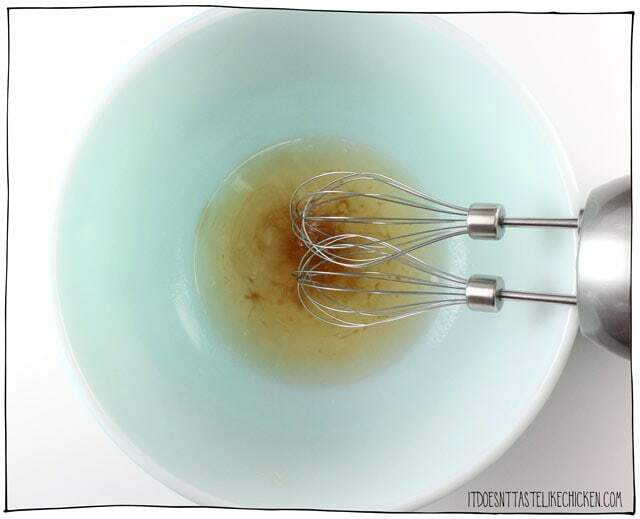 It may start to decrease in fluffiness after a day, but you can give it a little whisk to liven it back up again. But do you think by adding liquid glucose it will be sticky like original marshmallow fluff made with egg. And without glucose it will be like just an meringue icing . I’ve never cooked with liquid glucose so I’m afraid I can’t help you there. I recommend trying the recipe as written before doing any experiments. Enjoy! Would a stevia/erythritol mix work in this instead of the sugar? I’m not sure, sugar free cooking isn’t really my thing, you’re welcome to try tho! Do you think you could add veggie-gel (vegetarian gelatin) to this and turn it into marshmallow? I’ve never heard of veggie-gel before, so I am afraid I have no idea what it’s like to work with. Sorry I can’t be more help! Would this work in fudge? I haven’t tried it, but my guess is not that well. Love this! I made it twice, first with salted then with unsalted. I couldn’t really tell the difference (they both were slightly beany, but only slightly). The second batch was a half batch, but I ended up having to add a little more cream of tartar because 1/8 tsp wasn’t enough for stiff peaks. So happy you enjoyed it so much, Nancy! I followed the recipe and my fluff never stiffened really. Any thoughts on what may have caused this? It’s hard to say without being in the kitchen with you. Did you make sure to add the cream of tartar? That’s key. I imagine different brands of chickpea brine would vary. Sometimes it can take a long time to whip up, even over 15 minutes! You just have to be patient. Hope that helps! Can I toast it in the oven? And can I use coconut sugar? It’s the only one I have in hand. Yes, just be careful not to burn it, it toasts quickly. I believe coconut sugar should work fine, although I haven’t tested it myself. 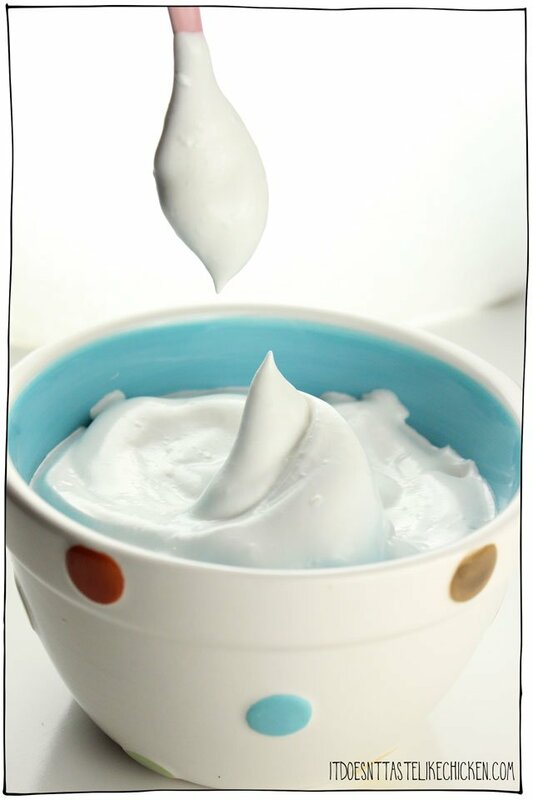 I tried your easy vegan Marshmallow fluff today and oh my! It is delicious! Thank you so much! 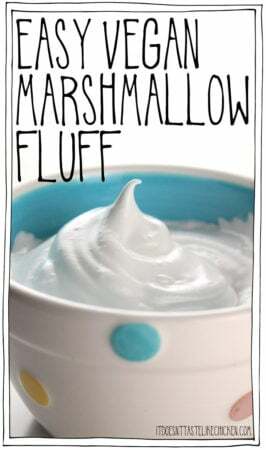 I will post my blog with photos of the marshmallow fluff here because I can’t figure out how to post just the photo here. I will be using this on my hot chocolate when the cold weather arrives! I’m not 100% sure as I haven’t tried it myself, but it sounds a bit risky. I would stick to a chocolate frosting recipe instead. Hi. I have a question. Would this work to make homemade rice krispy treats? Please help 🙂 I want to mix this with Dandies for the marshmallow layer of a smore’s bar recipe. Tried a more complicated one and it doesn’t seem to be working for me and I do NOT want to drive to find Smucker’s marshmallow topping SO I am pretty glad I found this. My QUESTION though – Do you think it will hold up/survive the elements being baked like that? I imagine it might disintegrate too much and either disappear or possibly cause sogginess on the graham layer. What are your thoughts? Hi Alisha, I haven’t tried it in a recipe like that but I my guess is that it wouldn’t work. I believe it would likely just melt away and make your bars soggy. I would love to try this but was unsure of the sugar. Is this the regular white sugar or powdered sugar? Inspired, thanks Sam! Delicious on the tart and tangy rhubarb that’s just coming up in my garden, I’m looking forward to trying it on blackcurrants when they come in to season. It totally works as a frozen dessert too – marshmallow sorbet perhaps?! I guess because of the high sugar content, it doesn’t freeze really hard, it’s just nicely scoopable. I’m thinking I might add some blackcurrant powder to the next batch for pretty colour and a touch of berry flavour. Making soup for lunch and what do I do with the cannellini bean liquid while waiting for the soup to simmer? Well, see if it works for this vegan fluff! This is the first time I’ve tried this recipe and it won’t be the last. Awesome! (and yes, the cannellini liquid works. 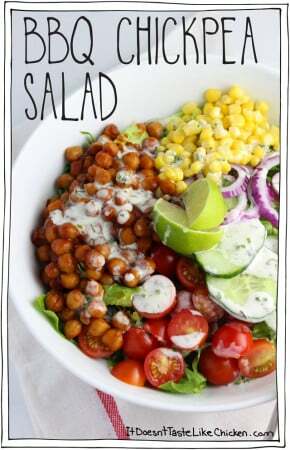 I can’t compare since I haven’t tried the chickpea yet, but I will!) It changes supper plans to baked squash so I can use my fresh fluff 🙂 Thanks!!! I saw the title and almost skipped right over it for fear of candy thermometers and fussy instructions. Then I realized I knew better and someone who just gave us Fuss-Free Vegan wouldn’t do that to us! This looks absolutely awesome!!! Hahaha! I wouldn’t do that to you for sure 😀 I hope you love it! 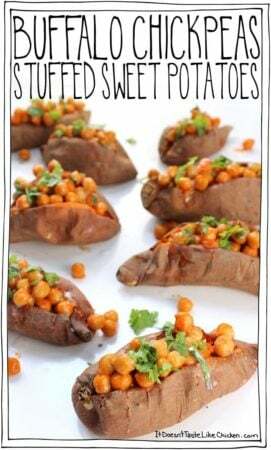 I followed this recipe to a T and it was fantastic!!! You could never tell it as made from bean juice!! Lol!!! 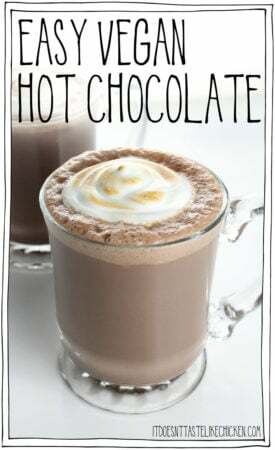 I topped my homemade vegan hot chocolate with it this morning and was in heaven! Thank you so much… GENIUS!!!! Oh boy this looks deliciously tasty!!! I can’t wait to try this!! Thank you!! Ok so I had no idea about some sugars not being vegan, good to know. Thank you for that info. I was wondering can the sugar be replaced by another kind? I haven’t tried any other kind of sugar in this recipe, so I would recommend sticking to a white sugar. Just look up which sugars are vegan in your area 🙂 Enjoy! 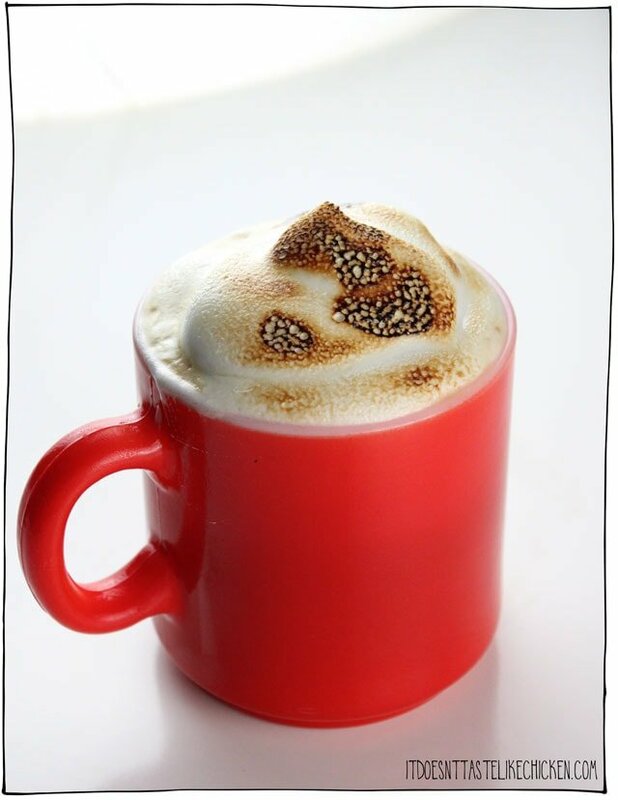 how do you get the fluff to toast on your hot beverage? I wonder…….will this work for rice crispy treats? Thanks Sam! I will have to try that. Hi Diane, for meringue for a pie I would recommend following the directions for my Lemon Meringue Pie in my cookbook Fuss-Free Vegan (page 188). I think this would work well to dollop onto a cake slice when serving, but as the fluff breaks down and gets watery over time, I wouldn’t suggest frosting an entire cake. Hope that helps! How long does this keep in the frige in a “fluff” state? About a day. After that, the water starts to separate but you can whip it back together. Looks delish! I’ll make sure to make some for Christmas gatherings! Tx Sam! This looks sooooo good! I make hummus from scratch a lot and will always have a liquid left from cooking the chickpeas. Do you think it will work as well as the canned chickpeas liquid? I used Zulka Morena Pure Cane Sugar… fully vegan… same texture as white sugar. 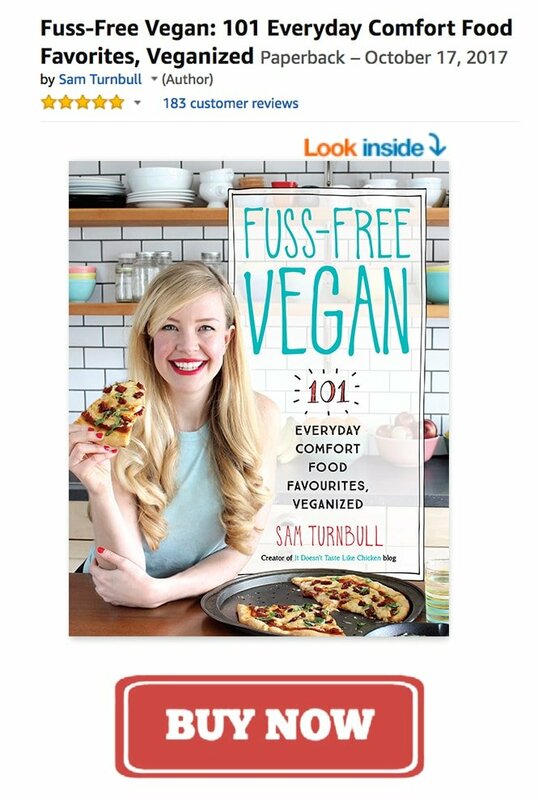 This looks like a fun thing to make, and I note with great appreciation that you have included several recipes for using the ‘Fluff’ as well as the chickpeas that no longer have their aquafaba. Well done Sammie!